Over the long weekend, I thought it would be nice to complete the painting of my bathroom. If you remember correctly, I had started painting ole peachy blue way back in May. Being the procrastinator that I am, I’ve put off completing this little project until now. Actually, to be honest, it’s really not done yet. I still have some cutting in to do, and the cupboard doors still need to be painted. Unfortunately, those are still lime green, completely throwing off my soft blue soothing vibe. Anywho, the ceiling of the bathroom was still the same old grubby white it was when we bought our little castle. So, off to Home Depot I went to purchase paint for ceiling. Now, being the novice I am, I thought that picking out paint for the ceiling would be a no brainer. I just wanted a boring white ceiling, that wouldn’t grow fun little organisms. A paint by Glidden seemed to fit the bill, it went on pink and dried bright white. Perfect! I would know where I had missed so that none of the old grubby white would show through my pretty new clean white ceiling. Happily I went a painting, within an hour or so, my ceiling was pink, and slowly turning to white. Had I been thinking like a blogger I would have taking a picture at this point. But unfortunately, I was being very task minded and just wanted to gitter dun. And gitter dun I did. Within another couple of hours, my ceiling was bright white and pretty! I was thrilled! Until the next day, when the morning showers were finished. And I discovered to my horror that bathroom ceilings do not stay dry…. 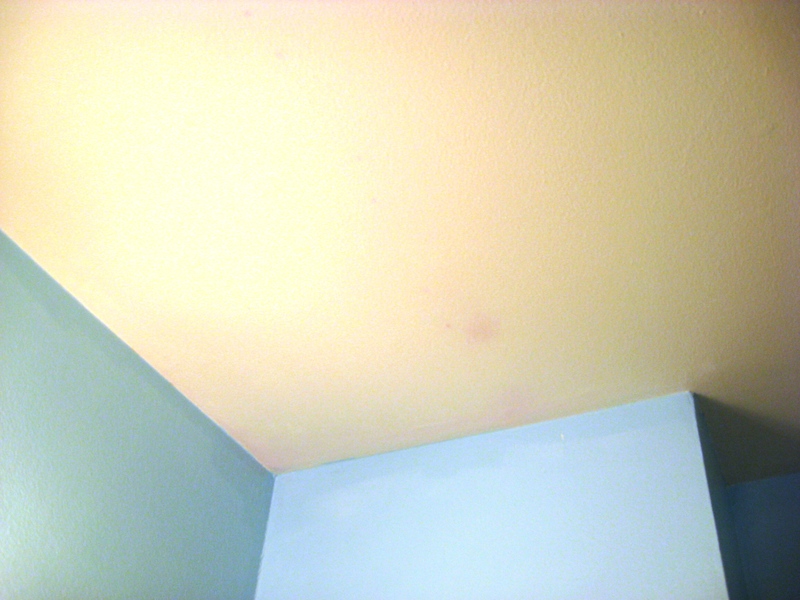 The above picture was taken after the ceiling had time to dry, so it was even pinker before. And no, that’s not something growing on the shower wall, that’s the plastic surround that we are planning on changing out someday. Hopefully soon…. Here you can see the pink spots more clearly. But I would like to mention that after a week or so the ceiling paint seems to have “aged” so the pink isn’t as abundant. I guess I’ll just have to chalk this up to another home improvement lesson. 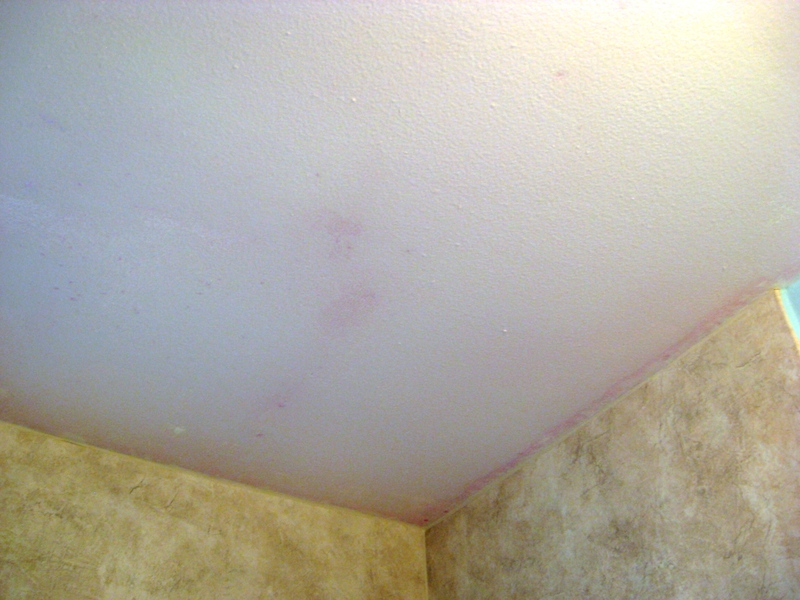 Paint that goes on pink when wet, but dries white, does not stay white in a bathroom with poor ventilation.